Investigators in the Vanderbilt Diabetes Research and Training Center (VDRTC) and collaborators at Stanford University have discovered new insights into the molecular mechanisms of cell proliferation in juvenile human pancreatic islets, information that could lead to new treatments for diabetes. In both type 1 and type 2 diabetes, the insulin-producing beta cells found in cell clusters in the pancreas, known as pancreatic islets, are either destroyed or become dysfunctional, leading to insulin deficiency. Insulin is the hormone responsible for the regulation of blood glucose levels. The study, one of the first demonstrations of the ability to stimulate growth of human beta cells in a living animal model, is described in a paper published this week by The Journal of Clinical Investigation. The investigators took viable samples of human pancreatic islet cells obtained from both juveniles, defined as age 10 or younger, and from adults, defined as age 20 to 60 years old. The islet cells were transferred into a mouse model lacking an immune system, which allowed the human cells to survive and function for several months. These types of human islet cells had increased rates of proliferation after transfer into the mouse model, indicating this was an intrinsic property of the juvenile islet cells and not the pancreatic environment. From previous studies, it was known that beta cell growth rate declines with age, and this study further investigated that age dependence. Using a drug analogue of glucagon-like peptide 1 (GLP-1), a common clinical treatment for type 2 diabetes, it was shown over a period of four weeks that beta cell proliferation was stimulated only in the juvenile islet cells, but not in the adult cells. In comparing the islet cells, it was discovered that the GLP-1 receptors were similar in both juvenile and adult pancreatic islets, suggesting that pathways inside the human juvenile islet cells were responsible for the different response in adult islet cells. To further explore the age-dependent proliferation, the team examined the cellular signaling pathways. A pathway is a series of interactions among the molecules of a cell that lead to a specific product or change in a cell. According to the U.S. Centers for Disease Control and Prevention, more than 30 million people or 9.4 percent of the United States population have diabetes. In 2015, more than 1.5 million individuals developed diabetes. Alvin Powers, M.D., Joe C. Davis Professor of Biomedical Science and director of the VDRTC, said the study’s discoveries are the result of Vanderbilt’s long-standing research expertise in diabetes and pancreas and islet biology. “This is also a great example of the collaborative studies that are possible as a result of the infrastructure we’ve established here at Vanderbilt, investigations that are also supported by resources and talent available in the Vanderbilt Diabetes Research and Training Center,” Powers said. Powers and Seung Kim, M.D., Ph.D., at Stanford University, were co-senior authors on this manuscript. This research is supported by a grant from the National Institute of Diabetes and Digestive and Kidney Diseases (NIDDK) of the National Institutes of Health (NIH) (DK104211), awarded in 2014, and by grants from the JDRF and the VA Research Service. The NIH grant is part of a NIDDK initiative, the Human Islet Research Network (HIRN; https://hirnetwork.org/). 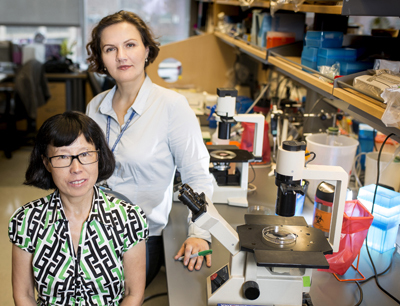 Vanderbilt is among 40 institutions in five countries participating in HIRN, which is organized into 33 different research projects and five consortia focused on different aspects of beta cell biology and type 1 diabetes. Dai’s co-first author is Stanford University School of Medicine post-doctoral fellow Yan Hang, Ph.D. Hang was formerly a graduate student at Vanderbilt University School of Medicine, working in the lab of Roland W. Stein, Ph.D., professor of Molecular Physiology and Biophysics. Additional collaborators included investigators at Allegheny Health Network; Hudson Alpha Institute for Biotechnology; University of Massachusetts Medical School; and The Jackson Laboratory.